All action times are CETBy 16:51, two minutes after opening fire, Lutzow hadalready hit Lion twice.At 17:10 Lion hit back but at the same time one of Lutzow&apos;s 30 cm shells penetrated Lion&apos;s Q turret starting a magzine fire. The magazines were flooded but 30 minutes later a fire ignited causing a huge pillar of flame. At 17:03 Indefatgable was succesfully hit by on der Tann. After she had exploded, Beatt&apos;y lin turned away but in doing so Seydlitz and Derfflinger concentrated on Queen Mary which exploded at 17:26. At the end of the Run to the North, Lutzow&apos;s WT cables were damaged reducing her communications to searchlight signals. Attacks from the British 3rd DF and 4th LCS on the Run had not succeeded. Onslow and Acasta had launched unsuccesfully. 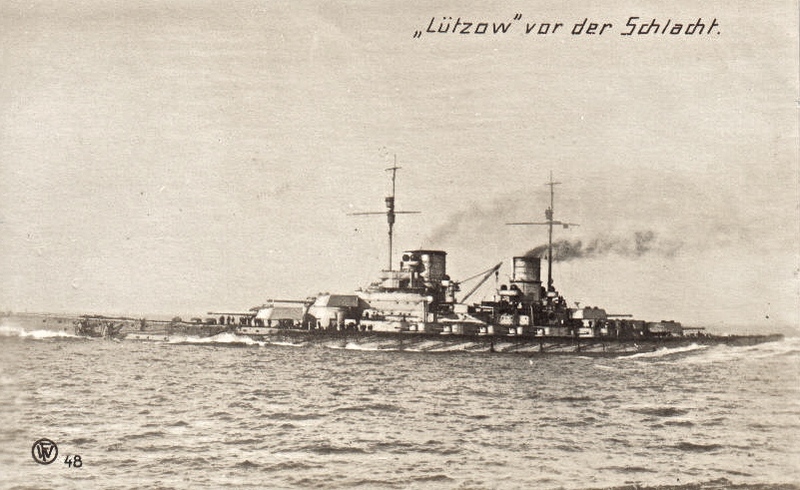 Onslow was hit three times by Lützow&apos;s secondary armament. At 19:15 Defence joined in the attack on Wiesdabden. Hipper thought she was actually the Rostock and did not fire. At 19:16 Harder opened fire and after 5 salvoes on target the Defence blew up at 19.19. 19:24 Lützow was heavily under fire from the 3rd BCS. Invincible scored 8 hits and then became a target herself. Lutzow and Derfllinger concentrated fire on her and at 19:33 she exploded, Lützow&apos;s third salvo penetrating her midship&apos;s turret. Soon after 19:30 the Grand Fleet was encountered. Scheer could not get away without sacrificing his slower pre-dreadnoughts. His 180 degree turn to starboard putting them on his diengaged side.Hipper left Lützow on board G.39 to seach for another flagship. G.37 and G.45 trued to lay a protective smoke screen but before it was finished the ship was hit four times in quick succession. Her forward and rear turrets were put out of action and at 20:45 she had fired her last shot. Lützow tried to keep up with the fleet at 15 kts but visual contact was lost at 22:13. By 00:45 there was still a chance of her getting back though her speed was down to 7 kts. At 01:00 she had taken more water than her pumps could handle. The forward boiler room flooded at 01:30. At 02:20 she was in danger of capsizing with 8,000 tons of water on board. By 02:45 water was up to the bridge and "Abandon Ship" was ordered. After G.37, G.38 and G.40 had taken as many of the crew as possible off, G.38 put two torpedoes into to her to sink her. She&apos;d been hit 24 times by heavy shell. 12 Schulz-Thorneycroft boilers, 235 psi, 4 shaft Parsons turbines giving 80,988 shp in trials. 4 x 8.8 cm in 4 single mounts.